On 16-17 October 2018, in Bucharest, Romania was held the 6th Balkan Petroleum Summit. This event, organized under the auspices of the Romanian Ministry of Energy, was an ideal opportunity for oil and gas companies and other companies to participate in bilateral discussions and meetings with the line ministries of the Balkan countries and the National Agencies responsible for Hydrocarbons. In the summit attended representatives of National Agency of Natural Resources, headed by Mr. Adrian Bylyku, Executive Director. The focus of the Summit was on: current research opportunities, geological assessments, legal framework, licensing rounds in Mediterranean countries, as well as recent developments in the oil and gas sector in the Balkan region. Mr. Bylyku, as a guest speaker at this summit, made the presentation on “A thorough overview of the hydrocarbon sector in Albania”. During the presentation, emphasis was put on technical assessments and opportunities for exploration of oil and gas resources, the current licensing situation for free blocks, foreign investment in the hydrocarbon sector, as well as the legal and regulatory framework. Throughout the days of the event, were held several important meetings with representatives of counterpart institutions of neighboring countries like Greece and Montenegro. In these meetings, it was agreed to bring the cooperation to formal terms for exchange of experiences on issues of mutual interest, co-ordination for joint projects, and discussed on uniting clauses in cross-border explorations, according to which the countries agree on the possibilities of making the most efficient use of the respective resources. 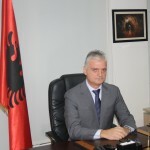 International companies operating in the field of research and production in the hydrocarbon sector, participating in this summit, expressed special interest in consulting the geological-geophysical data of free blocks in Albania as potential investment opportunities.